Ancient architects skillfully chose a place, erecting a building and a whole ensemble in harmony with nature. They subordinated the forms of construction to a single law – beauty: “And he created height, like measure and beauty will show.” Such an ideal place on the Nereditsa hill, on the right bank of the Volkhov, near the Settlement, the country residence of the Novgorod princes, was chosen for the Savior. The following year, in 1199, the Novgorod masters decorated the temple with frescoes. A few centuries later, in the nineteenth century, these murals brought the monument to world fame. According to experts, the ancient Nereditsa paintings were the largest medieval ensemble not only in Russia, but in the West. Unfortunately, they died during the Great Patriotic War, less than 15 percent of the murals survived. Placed in 9 tiers of frescoes completely covered the dome, arches, walls and pillars of the temple. Only insignificant fragments of this magnificent ensemble have survived to this day: images of holy wives are preserved in the diaconal of the church; the altar paintings accidentally survived the images of Saints Peter of Alexandria and Elijah the Prophet, part of the figures of saints, mutilated by fragments of shells. Miraculously escaped complete destruction and the monumental composition “Baptism”, written on the southern wall of the church. By decision of UNESCO in 1992, the Church of the Savior on Nereditsa was included in the World Heritage List as the most valuable historical and cultural monument. 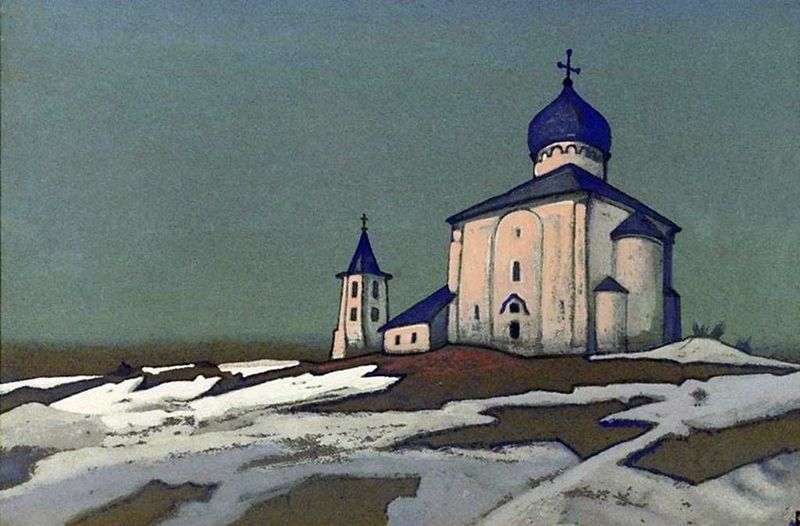 Description and meaning of the painting Savior Nereditsa by Nikolai Roerich.